These days everyone wants to put a positive spin on each year’s vintage, wanting, rightly or wrongly, to stand out in a crowded digital landscape. But after last year’s ‘marmalade harvest‘, people may actually be justified in wanting to go on at length about just how great 2015 has been. The spring saw little hail but then came the summer with an extended heatwave that left the region suffocating throughout July. Of course hot Julys are not atypical. The Catalan refrain (that deserves its own T-shirt some day) is al juliol, ni dona ni cargol, or ‘in July there are neither ladies nor snails’ or that you can’t find snails and it’s too hot for “lovin'”. It was initially a beneficial heat as it promoted wonderful veraison, but as it went on unabated, there were fears of another 2003. Viticulturists were getting up at 5 am to cut back the vine growth that had gone quickly from excellent to excessive. As August arrived, fears of an incredibly hot vintage were forgotten as cool evenings and light rains washed over the region, relieving vine stress and preserving acidity but with sufficient heat to continue maturity. 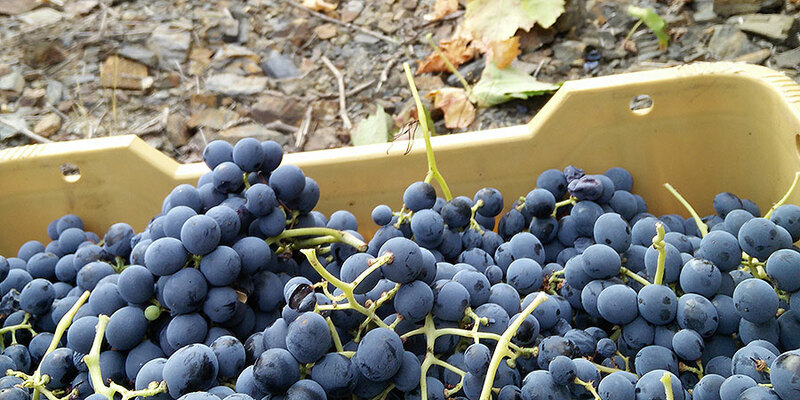 While there were a few who started harvesting their reds at the end of August, the harvest for both Priorat and Montsant began in earnest in mid September. A couple of wonderful days were followed by the threat of rain. Thankfully for the county of Priorat (encompassing both DOQ Priorat and DO Montsant), the rains passed right around them, demonstrating how this region is such a pocket of climactic uniqueness. The harvest continued throughout October and the very last grapes came in just at the start of November in both appellations, which is one to two weeks earlier than usual. The grapes were extraordinarily healthy with next to no mildew nor rot. The grapes (as seen above) were in perfect shape for both regions, allowing for what many people are thinking will be another classic vintage. This year saw a changing of the guard in DO Montsant with a new president Pilar Just. Jaume Domènech decided to step down after being president since the appellation’s creation in 2002. Pilar and her husband Xavier Peñas own the winery Sant Rafel in the village of Pradell de la Teixeta and she is very excited about the harvest for both her own winery as well as for the region at large. The Joan d’Anguera winery is in the village of Darmós and is so far south that it’s actually in the neighboring county of Ribera d’Ebre, which a small part of DO Montsant slips into. As they farm both organically and biodynamically, their susceptibility to nature’s whims makes them something of a local canary in the coalmine in terms of evaluating the vintage. Despite all the excitement about the 2015 harvest, it’s important to note that while the harvest of 2014 was difficult, the resulting wines have been shaping up quite well. This returns to something a winemaker once told me: ‘ If you can make a wine in Priorat, it will be a good wine.’ Of course it helps if you’re starting off with grapes that are in as beautiful a state as those of 2015. Only time will allow us to see how the wines from this harvest emerge but chins are indeed up while eyes are already looking to 2016.